Antique Map of Asia by Speed titled ‘Asia with the Islands Adioyning described, the atire of the people & Townes of importance, all of them newly augmented by J:S: Ano. Dom: 1626′. This beautiful carte-a-figures map is the first English printed map of Asia. It is flanked by costumed figures of Asian peoples with a series of eight city views forming a decorative frieze across the top, including Damascus, Jerusalem, Aden, Hormus, Goa, Kandy, Banten and Macau. 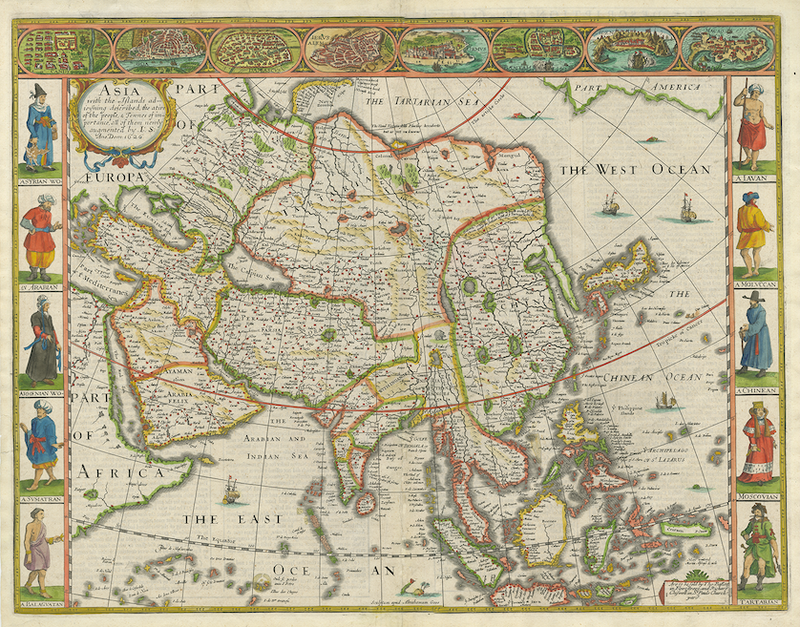 Published in London in the year 1676 by the famous John Speed, this unique map is largely based on Jodocus Hondius’ map of Asia published 50 years earlier in Amsterdam. Korea is shown as a slender oddly projected Peninsula. The Great Wall of China is shown , along with and Elephant above the source of the Ganges. A nice simple/naïve Northeast passage along with a piece of North America and sea monsters in the extreme North Pacific and Southern Indian Sea. The text on the verso presents a fascinating Anglocentric view of Asia in the early 17th Century. In 1575, Speed married a woman named Susanna Draper in London, later having children with her. These children definitely included a son named John Speed, later a “learned” man with a doctorate, and an unknown number of others, since chroniclers and historians cannot agree on how many children they raised. Regardless, there is no doubt that the Speed family was relatively well-off. By 1595, Speed published a map of biblical Canaan, in 1598 he presented his maps to Queen Elizabeth, and in 1611-1612 he published maps of Great Britain, with his son perhaps assisting Speed in surveys of English towns. At age 77 or 78, in August 1629, Speed died. He was buried alongside his wife in London’s St Giles-without-Cripplegate church on Fore Street within the Barbican Estate. Later on, a memorial to John Speed was also erected behind the altar of the church. According to the church’s website, “[His was] one of the few memorials [in the church] that survived the bombing” of London during The Blitz of 1940–1941 … The website also notes that “[t]he cast for the niche in which the bust is placed was provided by the Merchant Taylors’ Company, of which John Speed was a member.” His memorial brass has ended up on display in the Burrell Collection near Glasgow. Speed drew historical maps in 1601 and 1627 depicting the invasion of England and Ireland, depictions of the English middle ages, along with those depicting the current time, with rough originals but appealing, colorful final versions of his maps. It was with the encouragement of William Camden that Speed began his Historie of Great Britaine, which was published in 1611. Although he probably had access to historical sources that are now lost to us (he certainly used the work of Saxton and Norden), his work as a historian is now considered secondary in importance to his map-making, of which his most important contribution is probably his town plans, many of which provide the first visual record of the British towns they depict. In years leading up to this point, while his atlas was being compiled, he sent letters to Robert Cotton, part of the British government to ask for assistance in gathering necessary materials. With maps as “proof impressions” and printed from copper plates, detail was engraved in reverse with writing having to be put on the map the correct way, while speed “copied, adapted and compiled the work of others,” not doing much of the survey work on his own, which he acknowledged. The atlas was not above projections of his political opinions” Speed represented King James I as one who unified the “Kingdoms of the British isles.” In 2016, the British Library published a book, introduced by former MP Nigel Nicholson and accompanied by commentaries by late medieval and early modern historian Alasdair Hawkyard, which reprinted this collection of maps on the British Isles, showing that Speed had drawn maps of areas ranging from Bedfordshire to Norfolk and Wales. Most, but not all, of the county maps have town plans on them; those showing a Scale of Passes being the places he had mapped himself. In 1627, two years before his death, Speed published Prospect of the Most Famous Parts of the World which was the first world atlas produced by an Englishman, costing 40 shillings, meaning that its circulation was limited to “richer customers and libraries,” where many survive to this day. There is a fascinating text describing the areas shown on the back of the maps in English, although a rare edition of 1616 of the British maps has a Latin text – this is believed to have been produced for the Continental market. Much of the engraving was done in Amsterdam at the workshop of a Flemish man named Jodocus Hondius, with whom he collaborated with from 1598 until 1612, with Hondius’s sudden death, a time period of 14 years. His maps of English and Welsh counties, often bordered with costumed figures ranging from nobility to country folk, are often found framed in homes throughout the United Kingdom. Described as a “Protestant historian, “Puritan historian,” or “Protestant propagandist” by some, Speed wrote about William Shakespeare, who he called “this Superlative Monster” because of certain plays, Roman conquest, history of Chester, and explored “earlymodern concepts of national identity.” As these writings indicate, he possibly saw Wales as English and not an independent entity. More concretely, there is evidence that Speed, in his chronicling of history, uses “theatrical metaphors” and his developed “historiographic skill” to work while he repeats myths from medieval times as part of his story. Condition: Very good, attractive hand colouring.